I’m going to go with a book of poetry today! 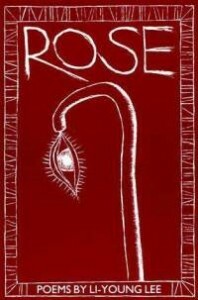 Rose by Li-Young Lee. This book is a thing of beauty. The poems are graceful, deep, moving. They are honest and humble, yet hold secrets. I come back to them over and over again. Persimmons – I love this poem because it hits on Lee’s Chinese heritage when he gets in trouble for mixing up the words persimmon and precision in school. From Blossoms – There’s a lot of fruit in these poems, and I love how Lee focuses on the senses so much – for him, the senses are emotional as well as physical. Here he talks about eating peaches – and much, much more. impossible blossom, to sweet, impossible blossom. Braiding – On the surface this is just a poem about him braiding his wife’s hair. But I think it is a very truthful poem about marriage. as the ceiling of that grew, dim hall . . . .
your hair each day . . .
. . . Love, how the hours accumulate. Uncountable. as we cross over one year and one year. What book have you read over and over? And here’s Karla’s answer today!